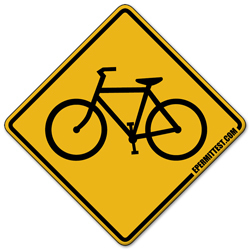 The bicycle crossing sign provides you with an early warning that the road you are traveling on will have a bicycle crossing up ahead. Slow down and be on the look-out for cyclists entering and exiting the road. Remember the rules of sharing the road with cyclists.